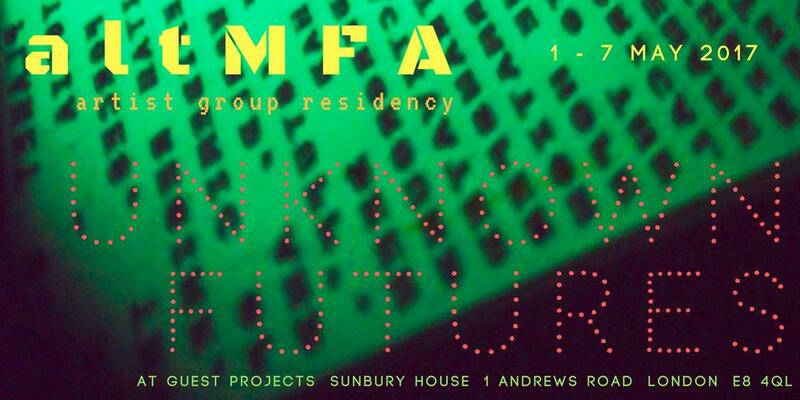 Then on Saturday 6th May we will be opening Guest Projects doors to the public showing recent work and experiments with our 'Unknown Futures' themed exhibition and events. 6.00pm A walk by Nathania Hartley and Marion Tu will begin from Guest Projects. Find your very own power animal (approx 30 mins). The exercise will use our intuition to focus in order get less lost in the maze of modern day distractions. The power animal is source of inner wisdom, whatever the future may bring. Eldi Dundee will be in the space giving experimental on the spot readings using a variety of oracle tools including: tarot, tea leaves, runes, crystal ball, palmistry and maybe, if we're lucky, she'll actually be right! A playful look at the seductive charm of divination through the rational/irrational lenses of agnosticism. Join us for a weekend launching our Unknown Futures programme, sharing what we're been exploring related to the theme during our week-long residency at Guest Projects through artworks, live events, food and fun. *Check details of timings closer to the event as the lineup and timings might be subject to change at the last minute. The most up to date version of the schedule can be found by clicking here.